If Sharks Could Fly -- Wait! -- They Can! the kids busy for hours! Scare the cat! Freak out the dog! Stalk the neighbors with the incredibly life-like motion! This shark is made of durable, high-quality nylon material. Just fill him up with helium at the local florist, party shop, or grocery store -- wherever they sell balloons. The shark will stay inflated for weeks and can be refilled over and over. Also comes in a clownfish version. For more information or to order, click here. 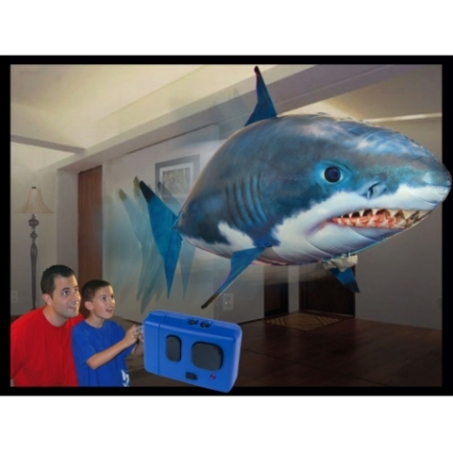 Air Swimmer's Flying Remote Control Shark, Clownfish, and Big-Mouthed Bass are also available from Amazon.com. For ages three and up.That covers Dad physically, and mentally! Happy Father's Day!